Ever wonder why some people are so charismatic, so magnetic, so compelling that others just gravitate toward them? How those people can lead groups of people to far corners of the world and get them to do the craziest things ever? Now, I’m not saying that’s a good thing. If you actually did have a goal of leading a bunch of people out into the middle of the desert to wait for aliens to come and rescue them, I’d recommend professional help. But consider this. Why do people follow such crazy cult leaders? How in the heck to they become convinced that there is a hidden spaceship behind a comet that is going to rescue them for their miserable Earthly lives? One of the most powerful ideas in hypnosis is the idea of structure vs. content. This pops up all over the place once you understand the hypnotic structure of human existence. What is the content of most cults? The actual idea that they are organized around? It’s usually something too nutty to even make a sci-fi movie about, let alone build an organization around. Something so out there, you’d think that EVERYBODY involved must be crazy. But Some Cults Get Amazingly Wealthy! Yet, some of the RICHEST cults around, are the ones with the CRAZIEST ideas. So crazy they CAN’T be true. So there must be something else going on. Something that most people miss. One of the hidden and misunderstood tricks inside the whole mishmash of NLP (which has kind of turned into a cult on it’s own…) is the idea of modeling. Of looking at somebody and copying their behavior. This is how you learned to walk, to talk, even to tie your shoes. In fact, for most of history, most human learning came through modeling. But then some goof thought it would be a good idea to force kids to sit in uncomfortable chairs and listen to boring people lecture us about boring things all day. Before our modern educational system, ALL learning came from modeling. When we were kids, we looked at the grownups around us, and tried to copy what they were doing. Walking and talking and everything else. The older we got, the more we wanted to copy the adults who seemed to be enjoying what they were doing. If we wanted a job, we’d have to find some guy or gal who was kind enough to let us copy them. In exchange, we’d sweep up their shop and do their dirty work. Over the years, we’d soon become a master ourselves. But we can take this normally unconscious process, and take it apart. So we can look at somebody, and only copy the stuff we WANT to copy. Keep the good stuff and leave the junk behind. When I was a kid, sometimes my mom or dad would get these boxes of candy. On the outside, they all looked the same. But for some, the insides were gross! (like coconut, yech!) For others, the insides was GOOD stuff. Caramel, chocolate, and more chocolate. What’s a kid to do in this situation? Take a bite and see! That’s what we’ve done with this course. Forget about the crazy ideas those cult leaders are preaching. That’s like the yucky stuff inside the candy. We don’t need that junk. We only want the good stuff. Now, what in the F… can be good about a cult? In order to get normal people to believe in insane craziness, you’ve got to have some SERIOUS charisma! Consider this mind experiment: Suppose an average cult leader decided he DIDN’T want to be a cult leader anymore. He wanted to go into real estate. What would happen? If you could take the cult leader skills, but live a normal life, you’d be unstoppable! If convincing people to go out into the desert and wait for flying saucers was possible, how many houses could you sell? How popular would you be at parties? What would your social life be like? That’s exactly what we’ve done with this course. We’ve modeled plenty of cult leaders, and taken out the yucky stuff (aliens, suicide pacts, murder, evading taxes, hiding out on ships, etc. ) and kept all the good stuff. Ever watch a baseball game? When professional baseball players are warming up, they swing a couple of bats. Or put a metal donut on to make the bat heavier. So when it’s their turn at the plate, the NORMAL bat will feel lighter by comparison. You can think of swinging two or three bats (when warming up) like being persuasive enough to lead your cult out in the desert and have a party with the cactuses (or cacti…or whatever call a group of those prickly things). When you take cult leader magnetism and apply it to your own life, EVERYTHING will be smoother. Heads will turn wherever you go. Any kind of persuasion will be a piece of cake. They party will follow YOU wherever you go. It’s long been recognized that if you want to be successful, you need to aim WAY HIGHER than what you really want. That is what you’ll be doing in this cult. By training your mind-body system as if you ACTUALLY ARE intending on starting your own cult, then EVERYTHING ELSE will be easier by comparison. Do you think preachers who can easily motivate thousands of their flock would have ANY trouble in a job interview? They’d be dripping with so much personal magnetism, they’d just need to stare the interviewer in the eye and say, “I think you should hire me,” and they would. Do you think a cult leader would ever be a wallflower? Wondering about the right thing to say, or worried about what would happen if he ran out of things to say? A cult leader would just walk in, stand in the middle of the room and wait for the party to come to him. Do you think cult leaders worry about paying the bills? Or the condition of the economy? Or silly things like elections or the state of society? A cult leader CREATES his own economy. His own society. Where We’re Going, You Don’t Need Roads! With cult leader skills and the irresistible magnetic energy that’ll always surround you, you will be cause, and the world will be effect. Worry will be a thing of the past. Of course, this much power CAN go to your head. So we STRONGLY recommend you come up with a few hard and fast rules that will keep you from going nutjob crazy. To keep yourself grounded in real life. To make sure your developing power doesn’t go to your head. But we’ve taken care of that for you. There are some simple guidelines you can follow, so you don’t end up listed with all the other wackjobs in history. In reality, there is not much difference between great leaders cult leaders and great business or religious leaders. The difference is HOW they use their energy and power. In that regard, these are just tools. But since you’ve read this far, you are likely going to use these to build a fantastic life for yourself and those around you. To lead others out of anxiety and worry and into happiness and abundance. Because you know that inside everybody is the potential for greatness. And YOU are going to be the one to set others free. The course manual will include all the information you need. All the understandings necessary. All the deep meanings behind the similar structures which you’ll begin to see everywhere. You’ll also get detailed tour of human history, human nature, why and how humans get together in certain groups. The truth of our economic and monetary systems. The way to communicate this knowledge to others, so you’ll be considered an authority. To make it easy, you’ll also learn plenty of easy exercises you can start doing today to build up your cult leader magnetism and energy. How to easily reframe conversations so you will always be in an authoritative position. How to frame your advice, no matter how small or large, so it will always be acted upon. Easy ways to start talking to people, simple questions to ask that will make YOU the authority in their lives. To make YOU the one who they will see as having all the answers. And after you understand the intellectual ideas in the course, you will. The manual will give you the knowledge of how complex groups stay together. The scientific insight into human nature, both our strengths and our weaknesses. 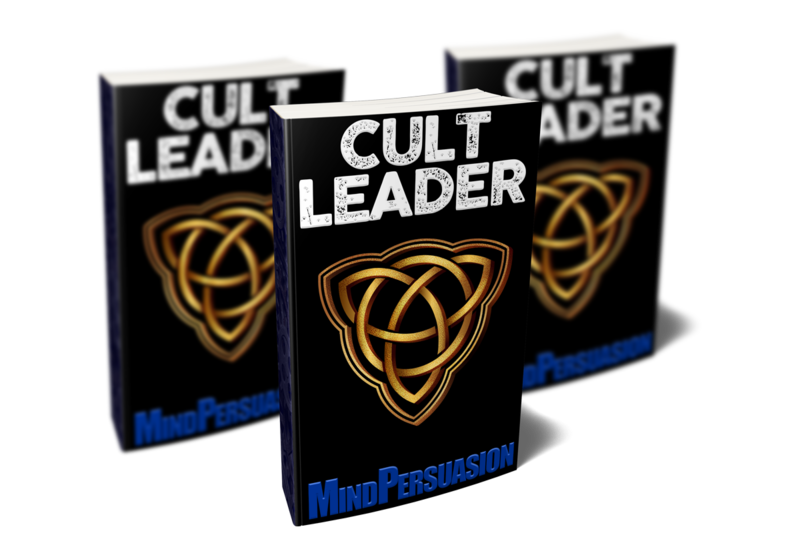 The conscious strategy and understandings to build the biggest most successful cult possible. The accompanying listening sessions will build your inner state to that of a natural cult leader. To develop the powerfully attractive inner mindset that makes you turn heads wherever you go. Combine the inner magnetism these listening sessions give you and the outer skills and understandings from the manual, and you will be an unstoppable force of human nature, and bring profound changes to those you let into your world. Be seen as a timeless leader. Resonate with truth and authority. Gain instant and deep respect from all who have the luxury of interacting you. Speak directly to their emotions. Cut through surface structure trivialities and move them on deep and profound levels. Give them heavenly emotions they won’t be able to feel anywhere else. Resonate nobility in all areas. Emanate expertise in all areas. Proclaim through your presence that you stand for truth and all that is good. Become a magnet for the very best people society has to offer. Feel at home proclaiming your truth in front of any audience. Move them to deep levels of profound resonance, and inspire them to take life changing action. Radiate irresistible attractive sexual energy on a subconscious level. Tap the infinite source of natural personal magnetism that powers your thoughts, actions and expressions. Feel a deep connection to infinite intelligence. Channel ancient truths in common situations. See beyond the mundane, and connect with others in a deep way. The ultimate in being. Transform any crowd by your mere presence. Simply inhale to speak and enjoy the expectant hush washing over your followers opening their minds for your divine message. Use to fine tune your cult leader skills or blast your subconscious with all voices and all statements at once. Use to build in a deep base of confidence or as the icing on the cake. Yeah, we know this sounds crazy! But since you can use these skills to improve ANY area of life, you get our standard 60 day, no questions asked guarantee. If you don’t feel you can use this to improve any and all areas of your life, (not to mention keeping sociopaths out of your head), you’ll get every penny back, no questions asked. Get this course now and start the next phase of your life. Whether you want to conquer the world, or merely conquer YOUR world, this course contains everything you need. The skills, attitudes and insights into human nature that will make any job or social situation obedient to your presence. Get this course now and take your life to the next level. Even if you want just an intellectual understanding of how cults and cult leaders operate, this guide will give you a fascinating insight into exactly how us silly humans really tick. No group, organization, political campaign (or even TV advertisement) will be the same again. Get this course now and see things the way they REALLY are, so you can squeeze the most of your physical experience. Build a real cult, build a billion dollar company, or just build your own life in the best possible way you can. With the deep understanding of human desires as well as human weakness and self deception, this will show you how to make the most of your relationships. Get this course today and learn precisely how to bring out the very best in those around you, and make your life and theirs as best as it can be.